Ok… so I feel old. About a month ago, I was on my way home from work, when I hear an advertisement for Everclear. 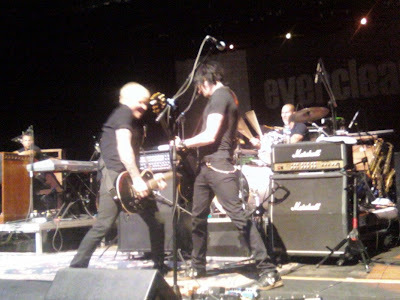 That night I mentioned it to Mark, and like a sweety, he bought tickets the next day. My mom was extremely nice and came down Saturday morning to watch Grant, so we could go. Mark had to work until 4 on Saturday, so I just met him at his parents house. I was sitting with his sisters talking, who are 19 and 29, and we were talking about the band. I felt SO old, because they didn’t really know who the band was, and this was one of my favorite bands in high school. Anyhow, we left and got to the place about an hour early. 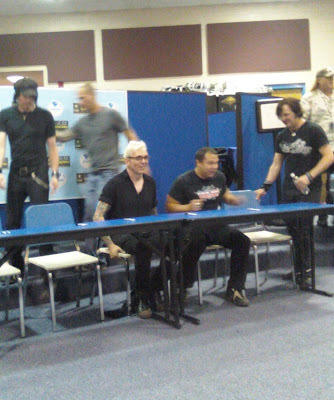 While we were standing in line, a woman from the venue came up to us and asked if it was just the two of us… Which she asked if we would like to meet Everclear… We were like, sure. Bonus number 1!! Once we got into the auditorium, we noticed the same lady standing in front of the stage. We walked closer to her, and she asked this other couple if the seats next to them were taken, and they said no. So she sat us there… Which were front row seats!!! Bonus number 2!! 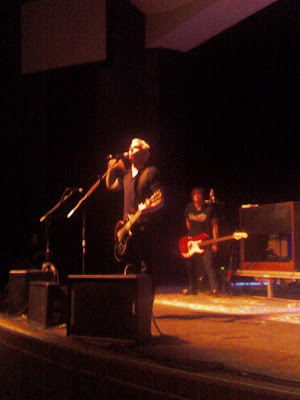 Everclear was a lot of fun to see! I have only been to two other concerts. Blues travelers, yeah not so much fun (just ask Megan) and the Boston Pops, with Adam and Wayne, which was a total blast, but in a different way. 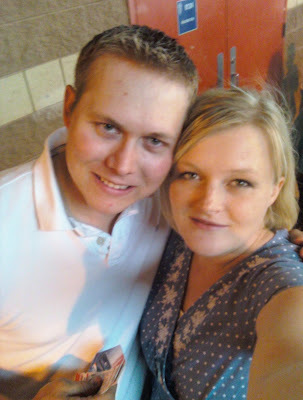 I loved being out on a real date with my hubby again!! We had a lot so much fun!! Mark even caught a guitar pick from the guy, bonus number 3!! All and all, we were home and in bed by 10:30… Yeah, we’re getting old!!! I LOVE YOU MARK, THANK YOU FOR A WONDERFUL NIGHT!!! Sounds like you guys had an amazing time! Too bad you didn't make it even more amazing! ;) Maybe next time!! The stork is getting ready! !